Over the long weekend we had a stall at the Old Bar Beach Festival. What a great town and festival! We were overwhelmed with the positive feedback and interest in our latest product trial – Gurbuchi (Gurạdji Kombucha). Fermented foods and drinks have a wonderful community culture surrounding them and it was great to share this with others as it was shared with me by my mum. Kombucha is traditionally made with black or green tea which contains caffeine. Caffeine is something we should all be trying to limit in our diets due to the negative impact it can have on our bodies. Using the kombucha fermenting method to create Gurbuchi is a perfect way to get the health benefits of kombucha without caffeine and the added benefits of Gurạdji. Gurạdji has high anti-inflammatory properties from the Caffeoylquinic acid, Quercetin and Kaempferol found in the leaves tannins. These compounds have been found to be beneficial in cardiovascular disease, high blood pressure, gout, prostrate inflammation, neurodegenerative diseases such as Alzheimer’s and Parkinson’s and cancers associated with inflammation such as colon cancer. Caffeoylquinic acid was found to out preform other anti-oxidants in reducing aflatoxin production by more than 95%! The bitter compounds found in Gurạdji are ideal for good gut health and compliment the probiotics found in Gurbuchi. At the festival many people asked me how they could make their own Gurbuchi at home, here is my recipe so everyone can enjoy the health benefits and refreshing taste for themselves anytime. Something to cover the top of the vessel which lets it breathe without letting fruit flies in such as a tea towel, coffee filters or paper towels. First we need to make the sweet tisane. Brew the loose leaf Gurạdji tisane with 80oC water, which is just as the first bubbles show or 1-2 minutes after boiling and stir in the sugar until it is completely dissolved. Allow to steep until the tisane cools to room temperature. Strain the loose leaf. Add the sweet tisane and Gurbuchi starter to your brewing vessel, adding the Gurbuchi second and stirring to combine. Cover and store away from direct sunlight. Depending on the temperature of your house it can take 1-4 weeks to be finished. Cover the mouth of the jar with a few layers of tightly-woven cloth, coffee filters, or paper towels secured with a rubber band. When brewing your own scoby and Gurbuchi, hygiene is incredibly important. Make sure you wash your hands before handling the scoby and all jars, vessels and utensils are cleaned and free from soap residue. Always be safe when fermenting: if you suspect something isn’t right, ask for advice or toss the batch and start a new one. Use your best judgement, bubbles, jelly-like masses, and gritty brown-coloured residue are all normal, fuzzy black or green spots of mould are not. The liquid should always smell fresh, tart, and slightly vinegary. If you need any advice or help along the way don’t hesitate to contact me and I will do my best to help out! I’d also love to hear how your Gurbuchi brewing is going and any positive stories or comments you have. Remember to have fun with it, fermenting is a great adventure! Hello I don’t have Gurbuchi starter, would it be OK to use a Kombucha Scoby and some of the Kombucha? Yes. You most definitely can use your Kombucha Scoby and starter culture. 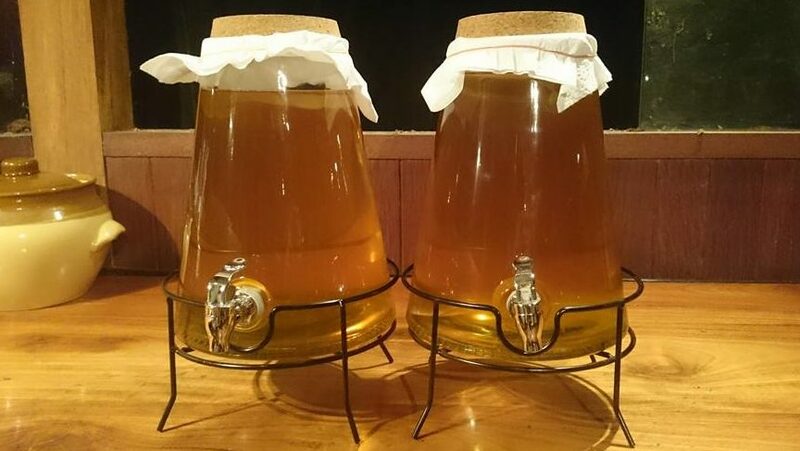 As the Kombucha Scoby is use to black tea as a food source it usually takes a few batches of brewing with the Gurạdji tisane to transition the cultures. After a few batches you will have a healthy and happy Gurbuchi Scoby! Happy brewing and let us know how you go. We love to hear from our fellow brewers.